All countries need modern and efficient communication systems to connect their economy and government departments. The Soviet Union, as long as it lasted, was the largest country in the world and it definitely needed efficient and secure means of communication between its distant geographic areas. 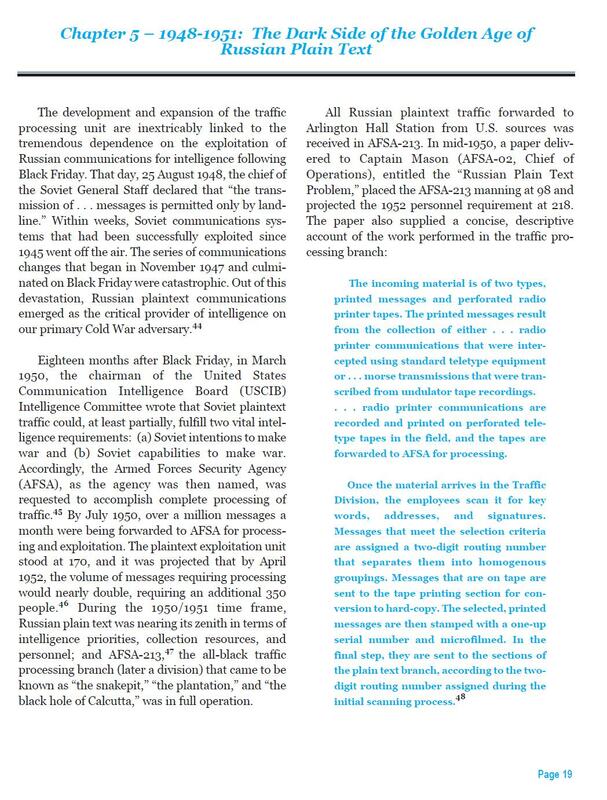 During the 1930’s the Soviets started using multichannel radio-teletype for internal communications. Considering the poor state of the landline system radio communications were a more economic choice and through the radio-teletype long messages could be quickly sent from one area of the SU to the next. As I have mentioned before, the German signal intelligence agencies took an immediate interest in the use of radio-teletype by the SU and in 1936 built a machine that could intercept the multichannel transmissions and print the text automatically. This work was carried out by the Army Ordnance, Development and Testing Group, Signal Branch Group IV C - Wa Pruef 7/IV C at an experimental station in Hillersleben-Staats. Some of these messages could be decoded but many were enciphered with OTP (which was unbreakable) or with a cipher teleprinter which the German called Bandwurm. 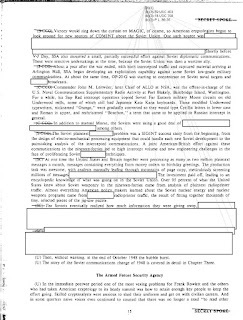 The plaintext messages were scanned for economic and military information. On average only 10% had interesting intelligence. However this percentage multiplied by the huge number of intercepts ensured a steady stream of valuable intelligence. From these messages the Germans got information on the Soviet economy and military mobilization data. The radio-teletype networks were practically the only source of information on what was going on in the Soviet interior. On the basis of this information the Wehrwirtschaftsnachr (WWN) were compiled. These bulletins gave a detailed summary of the Russian economic situation, particularly in the areas of Moscow, Baku, Rostov and included production figures and details of supply and labor situations. Alexis Dettmann, chief cryptanalyst in Horchleitstelle Ost, mentions economic traffic from the Urals and the Kuznetsk Basin in TICOM report DF-112 ‘Survey of Russian military systems’. Detailed card indexes of an economic nature were kept, they included names and locations of factories and personalities therein. Other agencies also intercepted the Soviet networks. It seems that Goering’s Forchungsamt used this traffic to evaluate the Soviet economy. The army agency OKH/GdNA also had an independent unit that intercepted Soviet teletype transmissions as part of its Group VI - OKH/GdNA Group VI. During 1942-4 this small unit operated in Loetzen, East Prussia under the command of Horchleitstelle Ost (Intercept Control Station East). It was this unit that was captured by an Anglo-American TICOM team in May 1945 in Rosenheim, Germany. The Germans and their equipment were transported to the UK and put to work so their methods could be evaluated. The Anglo-Americans then either copied directly the German equipment or built similar models and used them to intercept the internal Soviet network. The Anglo-Americans called the German machine ‘Russian Fish’ because it intercepted the Soviet teletype which they called ‘Fish’. This had a precedent in WWII when they gave fish names to the German cipher teleprinters. The Lorenz SZ42 was called ‘Tunny’ and the Siemens T-52 ‘Sturgeon’. Information on the American exploitation of the Soviet radio-teletype networks is still hard to find. However there are snippets of information from NSA official histories and a few books. The relative handful of American codebreakers who stayed on quickly shifted gears. The Soviet Union instantly became their number one target. Since the discovery of the Russian Fish machine by TICOM at the end of the war, and the ability to read a variety of diplomatic, KGB, and trade messages as a result of the Venona breakthrough on Soviet onetime pads, American codebreakers had been astonishingly lucky. Virtually overnight they were placed in what NSA has called "a situation that compared favorably to the successes of World War II." 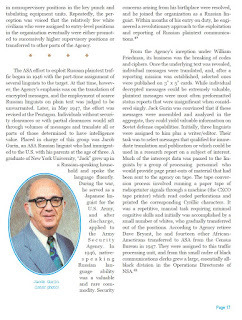 The official NSA history ‘American Cryptology during the Cold War: 1945-1989, Book I: The Struggle for Centralization 1945-1960’, in p169 gives a few snippets of info. The people involved in the plaintext problem were Olin Adams and Jacob Gurin. It was Gurin who saw that each plaintext message on its own was unimportant but taken together they could provide valuable intelligence on everything taking place in the Soviet Union. The effort to exploit the Soviet plaintext messages began in 1946. Initially they needed lots of translators and they ‘stole’ these from an OSS unit in Washington. However the sheer numbers of intercepts could only be handled through mechanization. For this reason they built a device that could scan the radio-teletype signal and print the text. This was the CX-CO device. The unit that sorted the plaintext messages was made up of African-Americans. Due to the importance of the program more people were added to the unit. In order to access the importance of the plaintext program we need to take a step back and look at the situation facing the Western intelligence agencies after 1945. In the first years after WWII ended the Anglo-Americans were able to exploit several Soviet codes and ciphers. However the Russians learned through their spy William Weisband that their codes were vulnerable and in 1948 instituted a complete change in systems and procedures. This was called the ‘Black Friday’ by the NSA (presumably because the Russians changed all their systems on a Friday, although some authors dispute that). At the same time Western intelligence agencies had no luck in creating spy networks inside the Soviet Union. It was at this time that the plaintext program became extremely important as it was basically the only way to find out what was happening in the Soviet interior. The millions of messages provided information on all aspects of Soviet activity. Especially important was the intelligence on the Soviet economy, the armed forces and the nuclear program. The height of the program came in the early 1950’s and was able to cover the ground lost from the ‘Black Friday’ incident. Still nothing lasts forever. As the Soviets built up their landline and microwave communication networks use of the radio-teletype was stopped. NSA history ‘The Invisible Cryptologists’ says that in 1956 the all-black unit was dissolved. At that time it seems the ‘Russian Fish’ source had dried up. More pieces of the puzzle are given from NSA histories. The ASA. 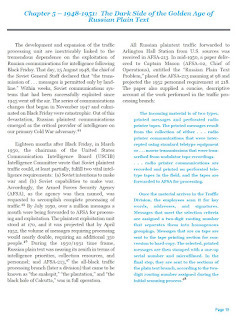 effort to exploit Russian plaintext traffic began in 1946 with the part-time assignment of several linguists to the target. 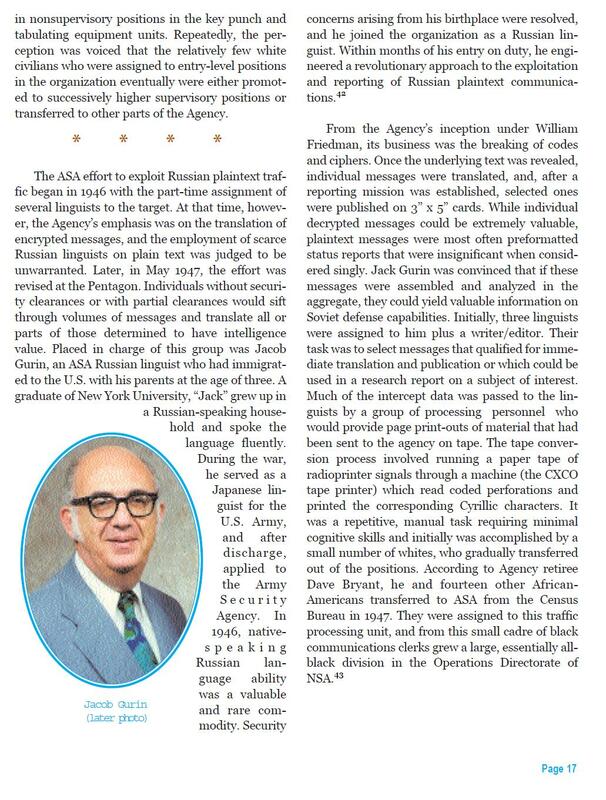 At that time, however, the Agency's emphasis was on the translation of encrypted messages, and the employment of scarce Russian linguists on plain text was judged to be unwarranted. Later, in May 1947, the effort was revised at the Pentagon. Individuals without security clearances or with partial clearances would sift through volumes of messages and translate all or parts of those determined to have intelligence value. Placed in charge of this group was Jacob Gurin, an ASA Russian linguist who had immigrated to the U.S. with his parents at the age of three. From the Agency's inception under William Friedman, its business was the breaking of codes and ciphers. Once the underlying text was revealed, individual messages were translated, and, after a reporting mission was established, selected ones were published on 3" x 5" cards. While individual decrypted messages could be extremely valuable, plaintext messages were most often preformatted status reports that were insignificant when considered singly. Jack Gurin was convinced that if these messages were assembled and analyzed in the aggregate, they could yield valuable information on Soviet defense capabilities. 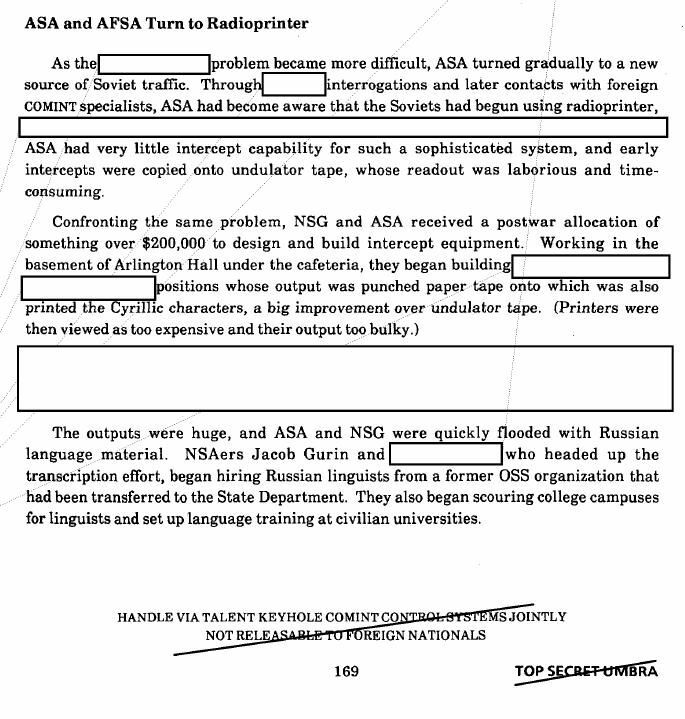 In addition to manual Morse, the Soviets were using a good deal of [redacted] among others. 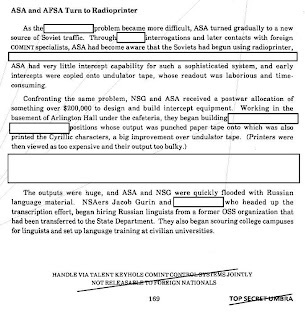 The Soviet plaintext problem was a SIGINT success story from the beginning, from the design of electro-mechanical processing equipment that could handle each new Soviet development to the painstaking analysis of the intercepted communications. A joint American-British effort against these communications in the nineteen-forties led to high intercept volume and new engineering challenges in the face of proliferating Soviet [redacted] techniques. At one time the United States and Britain together were processing as many as two million plaintext messages a month, messages containing everything from money orders to birthday greetings. The production task was awesome, with analysts manually leafing through mountains of page copy, meticulously screening millions of messages. [redacted] The investment paid off, leading, to an encyclopedic knowledge of what was going on in the Soviet Union. Over 95 percent of what the United States knew about Soviet weaponry in the nineteen-forties came from analysis of plaintext radioprinter traffic. Almost everything American policy makers learned about the Soviet nuclear energy and nuclear weapons programs came from [redacted] radioprinter traffic, the result of fitting together thousands of tiny, selected pieces of the jig saw puzzle. The use of radio-teletype by the Soviet Union was a matter of necessity. Due to the huge distances involved radio offered a better investment compared to the resources needed to lay landlines. The use of radio-teletype however offered the chance of interception for interested parties. In the 1930’s and 40’s the German signal intelligence agencies were successful in building specialized equipment that intercepted the Soviet multichannel transmissions and printed the plaintext. After 1945 it was the Americans that took over this work, after having been initiated into the secret by the OKH/GdNA Group VI unit. Through the ‘Russian Fish’ intercepts the Anglo-Americans were able to get millions of messages each month. When analyzed together they provided unprecedented intelligence on Soviet economic and military matters. The ‘Russian Fish’ story continues to be shrouded in mystery even today. Why has the NSA released snippets of information when they could release all the details? Such an old story has no value from a perspective of security. Perhaps there are other reasons. The NSA gets its billions of dollars in order to ‘break’ enemy codes. The ‘Russian Fish’ story was undoubtedly a great success but it did not have anything to do with codebreaking. The messages were plaintext. Perhaps they fear that their success with the ‘Fish’ highlights their failure with Soviet codes. There is also the question of the 1950’s controversies. If the ASA had ‘encyclopedic knowledge of what was going on in the Soviet Union’ how can we explain the bomber gap and missile gap affairs? Shouldn’t they have known that the Soviet Union did not have more bombers or nuclear missiles than the US? Another reason could be the German connection. Maybe the Anglo-Americans do not want to admit that Hitler’s intelligence agencies had technology and successes that exceeded their own. Or are the NSA/GCHQ preparing some book, through one of their friendly authors, that will present this story in the way they want it to be told? Again an excellent research job regarding the "Russian Fish" story. Regarding the secrecy, if I'm not mistaken, so far the NSA has acknowledged only one Soviet code-breaking success after 1945 : VENONA. Files about Soviet codes broken in 1946 ("Sauterne" and "Longfellow") have been reclassified. 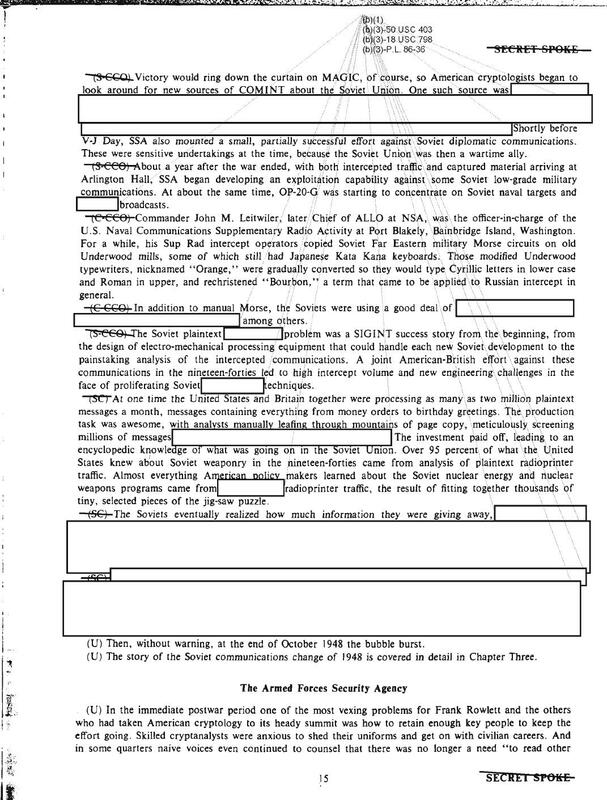 So I guess that the secrecy about radioprinters is simply the NSA's habit.